Candidates are lining up to run for Hawaii's open congressional seat in the 2nd District, and the early entrants agree that voters can expect a crowded field by Election Day. Former Lt. Gov. Mazie Hirono announced she was entering the race last week, along with three members of the Legislature. Several other Democratic hopefuls also have announced their intention to run for seat vacated by Senate candidate Rep. Ed Case but haven't notified the state Elections Office. At this rate, the number of candidates could rival the race four years ago, when 44 candidates were on the ballot following the death of Rep. Patsy Mink, D-Hawaii. No Republicans have announced for Congress in either of the state's two districts. Democratic Rep. Neil Abercrombie is expected to seek a ninth term in the 1st District after he said he won't run for governor against Republican Gov. Linda Lingle. "Right now, everyone is starting from scratch," said University of Hawaii political science professor Ira Rohter. "To me, there's no obvious front-runner. None of them has really set up organizations." 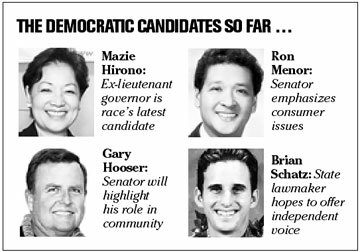 The candidates that filed last week were Sen. Ron Menor (D, Mililani), Rep. Brian Schatz (D, Tantalus-Makiki) and Sen. Gary Hooser (D, Kauai-Niihau). Hirono is the newest candidate to enter the political fray to try and replace Case, who is leaving his office to run against Sen. Daniel Akaka in the Sept. 23 Democratic primary. She has not yet filed her candidacy with the Elections Office. "I have a statewide group of supporters; I have the name recognition," Hirono said Friday while campaigning on the Big Island. "I'm taking my campaign to the people, which is what I've always done." The last office Hirono ran for was governor in 2002, when she lost with 47 percent of the vote against Lingle. Schatz said he could be an independent voice in Washington while still representing Democratic values. "What people are looking for is the Democratic Party to revitalize itself, and I hope to be part of that movement," he said. Hooser said he will emphasize his role in the community of the 2nd Congressional District, which includes rural Oahu and all the other islands. "To my knowledge, I'm the only candidate who lives on the neighbor islands," said Hooser, a Kauai resident who was the first candidate to file. "The competition is probably going to be shaping up over the coming few months. It's hard to say exactly who is running." Menor has said he wanted to work on consumer and health issues, but he didn't immediately return a phone call Friday. All the candidates will have a hard time pulling away from the pack because they are all trying to appeal to a similar political base -- liberals, Rohter said. "Nobody sticks out. It's a horse race. I suspect the winner will win by just a hair," he said. Other potential candidates include Senate Majority Leader Colleen Hanabusa (D, Nanakuli-Makaha), former state Sen. Matt Matsunaga; Sen. J. Kalani English (D, East Maui-Lanai-Molokai), and Honolulu City Councilman Nestor Garcia. Candidates have until July 25 to file for the race, but most of them will not wait long because they need to start raising money, Rohter said. A winning campaign will likely cost at least $500,000, he said.